Welcome to to our Easton locksmith services of LockTech24/7 in Easton, Pennsylvania. LockTech24/7 is your professional locksmith in Easton, PA. We’re local, and efficient Easton locksmith services. We provide Easton PA residents and visitors with an extensive list of mobile locksmith services. As well as 20 minutes response time, and non-stop 24 hour service. Customers can count on the reliability, and the professionalism of our locksmiths. And first thing to remember is we are fast. Throughout the years we have become a trusted name in professional locksmith services. Our Easton Locksmith Services cover residential, commercial and automotive locksmith services. When you hire us, you may expect us to provide you with exceptional service. For this reason we grantee your satisfaction. No matter your locksmith needs! We are well-equipped with the right professional locksmith tools and equipment to handle any locksmith task. Whether you need an auto locksmith or 24 hour emergency locksmith, our team is ready to help you in a fairly time manner. We strive for perfection! No matter the service, you receive the highest degree of experience and professionalism. Our goal is to leave you happy, so in a case and you need future service, you will be happy to call us again. From conventional locks to high-tech and security systems. We will keep you up-to-date and step ahead of burglars and thieves. 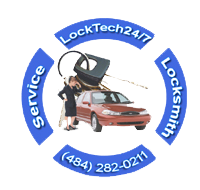 LockTech24/7 Locksmith Services is an easy way for consumers to find and connect with a trusted local locksmiths. We are independent locksmith company that help the Easton community for a long time. For this reason, we don’t hire contractors or third party company. How does it work? You can check our services, and contact us. We will be on the way, right away! Our comprehensive locksmith and security services design with low prices to meet the unique needs and the budget of our customers. We stand behind our labor and every security hardware we install on your doors. Therefore, we support our products and labor with a ninety days guarantee. In short, make sure to call us today, 100% satisfaction guaranteed. Our customers said it loud, we are the preferred locksmith choice in Easton, PA.. When you need professional, reliable, and fast locksmith service, give us a call for consultation. Find how our professionals can help you save money by providing amazing locksmith and security services for less. Our Easton Locksmith Services are only one phone call away. You never ready when the key break-off inside the lock or when it come for a need of emergency locksmith. Locking yourself out or losing your keys, can be a very stressful and overwhelming. But needless to say that it happens. As has been noted, we’re here to help! Stay calm and don’t worry, simply call us now. We are here for you, working day and night. Don’t hesitate to contact us for emergency locksmith services. Our locksmiths are prepared to come to your rescue for any emergency locksmith needs. In your time of need, call us soon as possible. We are equipped with the knowledge and tools to handle every emergency locksmith scenario. It may be that you’re in an emergency lockout, right now, or you lost your car key. We have the ability to pick, replace, and repair your locks. Our company is based on the belief that our customers’ needs are of the utmost importance. And as can be seen, we do our best to get you back as soon as we can. Our locksmiths are committed to meet those needs. As a result, high percentage of our business is from repeat customers and referrals. Don’t just take our word on it, please check our online reputation and read testimonials made by our existing customers. We would welcome the opportunity to earn your trust. In fact, we would like deliver you the best Mobile Emergency Locksmith Services in Easton, PA..
Don’t let that small problem turn into a crisis. Call us as soon as possible and let us correct minor issues before they end up becoming nightmares. Not to mention a life safety issue. Would you like fast automotive locksmith service? That shouldn’t be a problem, you’ve just arrived to the right place. As soon when you call us, we can open your car door as quickly as possible. Please do not try to open it yourself because you will damage your car. We can also make transponder keys and high security automotive keys on-site. Among our automotive services, we also provide ignition lock repair service. In any case of emergency locksmith service, please call us for faster service. According to a recent report by Forbes magazine, a car is stolen in the United States every 45 seconds. It is no wonder why with auto theft rates like this, more and more people are seeking authorized locksmith. 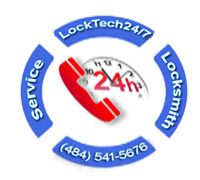 LockTech24/7 is insured, licensed, and bonded. Our automotive locksmith experts are here to service all your auto security needs. From opening your car to repairing your ignition lock, we can do it all. As well as replacing car keys. Generally speaking, we provide full automotive locksmith services resolving automotive lock and key problems. If you are in Easton and stuck on the road waiting for automotive locksmith help, don’t hesitate to call us. Please call now (484) 541-5676, and we’ll be on the way, right away. Home is where your heart is – your family! When you only have the key to get you in the front door of your house, you can call it home. When you install quality locks on your doors, you also keep your home safe. You can feel relief of protection. LockTech24/7 can have a skilled local residential locksmith on your door to perform essential home lockout, lock change, rekey, key replacement services, and more. Fast Easton locksmith services within 20 minutes of your call. 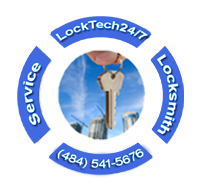 When security is your top priority, depend on LockTech24/7 for the most comprehensive and responsive service and support! Our mobile trucks are most of the day on the roads throughout Easton, Bethlehem, and Allentown, Pennsylvania. Our unique qualifications mean that we know how to safely, securely and effectively manage every opening in your home. Upgrading your home security could be the most valuable investment you make this year. 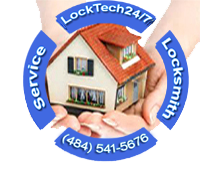 LockTech24/7 has professional home security consultants in your area trained to assess your home’s strongest and weakest links when it comes to safety and security. We are the uncontested leader of the Easton locks & locksmiths industry, don’t hesitate to give us a chance to prove you what fast and reliable residential locksmith is. We provide residential locksmith services of every kind, including lockout services, lock repairs, deadbolt fresh installations, lock replacements, lock re-keying, as well as digital lock reprogramming, and more. Call LockTech24/7 today (484) 541-5676 to schedule your home security assessment. Our residential locksmith technicians can repair jammed or damaged locks, install new locks, and help to make your home stronger. Do you own a store on the street or in the mall, office or other commercial space? We have great news for you because you have just found LockTech24/7, a premier commercial locksmith company in Easton, Pennsylvania. With all of the right tools and commercial locks on hand you can feel confident knowing that you made the right choice when you choose our business to help you. Commercial Locksmith Services play an important role in maintaining a secure environment in our business. When it comes to the security of your commercial and industrial space, you want the best locksmith company in the area, and you deserves peace of mind. We are a leading Easton commercial locksmith company, providing top quality commercial locksmith services and solutions for both large and small businesses for 24 hour a day, 7 days a week. Professional commercial Easton locksmith services for your business. We have highly experienced commercial locksmith technicians who are ready to assist you, and offer the best locksmith services in Easton, PA. Whether you require a locksmith technician for your storefront, office, or warehouse, we are the locksmith company to contact. No other commercial locksmith in Easton does it like we do. With an extensive range of services, trained locksmith technicians, the right tools and low rates, you can rest assure that all your commercial locksmith needs will be solved in a moment. Please call now (484) 541-5676, and we’ll be on the way for help.